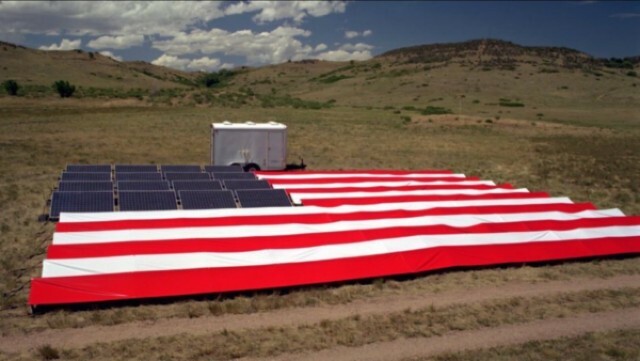 Earlier this year, towards the end of February, the number of solar power installations (commercial and residential) in the United States passed the one million mark! This total includes systems of all sizes, as well as pumping and telecommunication systems--and while rooftop residential solar power continues to make up the majority of installations, utility-owned projects make up the greater share of the capacity. The industry will continue to see strong growth in all areas. It's take nearly forty years to achieve a million solar power systems, but the second million is expected to occur by 2018 -- within just two years. Late in 2015, the U.S. solar market generated a total capacity of 27 gigawatts or just 1% of the total energy mix, but it is expected to go to three percent by 2020. Most new generated electrical capacity at present is coming from solar, wind and other renewable sources of power. 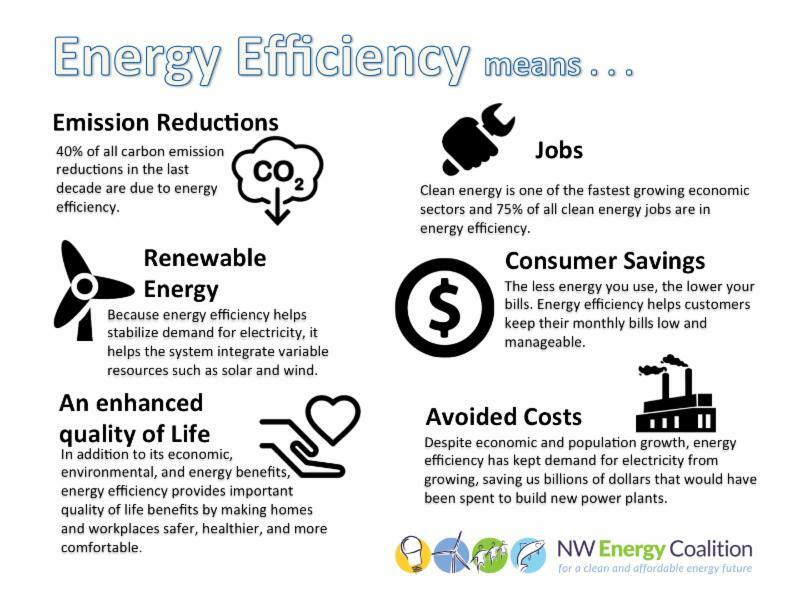 Reliable energy can be delivered at reasonable, competitive costs with little or no pollution, creating good paying jobs (more now employed by solar installations than the coal or steel industries). Lizard just loves this solar lantern. The photovoltaic industry has benefited from federal tax credits and policies such as RPF (renewable portfolio standards) at the state level, and that will keep industry growth good through 2020. As well, new technologies continue to keep costs low; and as natural gas prices rise (which are at historic lows), solar power will continue to be attractive to utilities, shareholders and homeowners. For gas refineries, you need to pipe or transport gas; with coal, its transportation costs (and its mining) are cost-prohibitive--but with solar, once you build the facility, the answer comes up every morning -- and free is always cheapest. Due to the great number of home installations, it's quite possible the millionth system was installed on a residence. 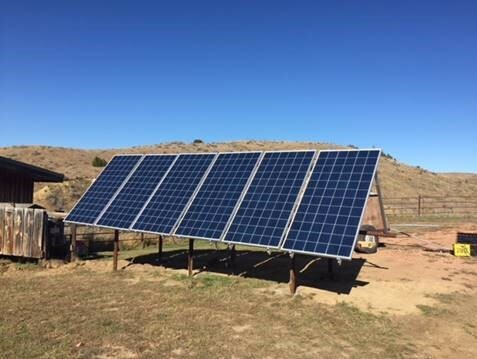 We at Oasis Montana have been enjoying the benefits of reliable solar power and low utility bills for several years with our home office system. It's not just a good idea for the environment, climate and future generations: it's just plain cool to obtain your power from the sun -- and makes a statement to try and be a steward for cleaner energy. And, it's also a hedge again utility inflation. Solar power is frequently contagious; many times a homeowner will see a neighboring installation and decide they want a solar power system too, to enjoy the benefits and 'cool factor' of solar power. 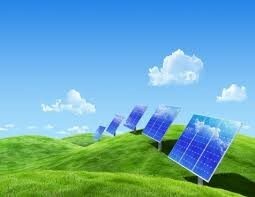 Solar power is just getting out of the starting gate, and has a long way to go! 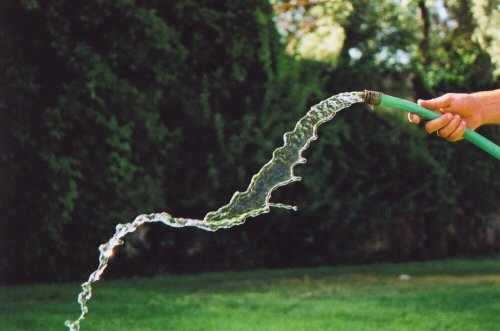 This spring and summer at Oasis Montana we had major water issues. Our well was slowly in the process of going dry, and had been going downhill in output and pressure. I noticed last year that my (3500 ft.) drip system didn't seem to be getting much water towards the end of the lines -- and when filling a bucket of water, there were a lot more particulates in it, even metal. I thought our pump was failing (even though our first pump lasted 23 years and only got replaced about 12 years ago). My pump guy comes out and runs a few tests and gives me the bad news, those words no one wants to hear: "It's not your pump, it's your well that's going bad". When our well was initially drilled in 1981, the static water level was at ~160 feet, and the pump hung at 180 feet in a 186 ft. deep well. Now the static water level had dropped almost 20 feet.... So my pump was sucking up a bunch of sand and even metal filings from the inside of the well casing at the bottom of the well. I have several neighbors who've had similar problems in the past few years-- their well filled with sand and they eventually had to drill another. The water table and the aquifers are dropping in our valley, according to the well drillers and pump setters. And mine was another casualty. There are thousands more wells in this area that have been drilled in the past 35 years, many more than existed in 1981. And we now have longer, warmer summers and less snowpack in the winter; it all adds up. Like many other parts of the country, the water table is dropping, and there continue to be more and more people, each with their own well, pumping out of the aquifers. When my well was going dry, we still had 10 to 15 minutes a day of water at the frost-free spigot (outside line) until the pump would start sucking up air, then it would shut down. We had to prevent the water from coming into the house as the particulates were actually clogging the plumbing (we eventually had to re-plumb the toilets and faucets because those tiny supply lines were clogged). So every day, I would fill up buckets for dishes and bathing, and then let the water run for a few minutes each on my fruit trees; it was enough to keep them alive, fortunately. So I had to have another well drilled, and this time we took it down another 100 feet, to 289 feet (@ $32/foot). I have a three horsepower variable speed pump in it now, that has a 'soft start' capacity, and it runs off my Outback Power Radian inverter. It took a while to get things figured out (initially, the first pump controller proved to be faulty), but finally by mid-August everything was back in excellent working order (except for my wallet!). And my hand-watering techniques kept all of my trees going -- we even ended up with bumper crops of apricots, peaches and apples. I certainly did learn that it's just not an oasis if you don't have water! If you need to look at different pumping options, call us or visit www.PVsolarpumps.com for more information. Merging nicely - two pump companies become one. 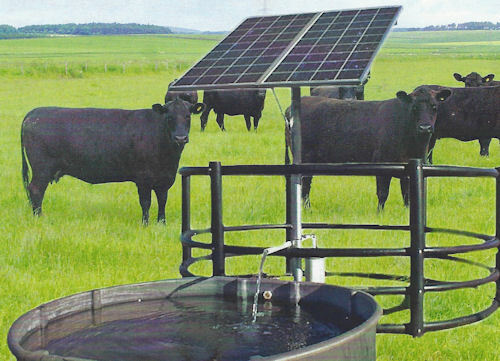 There has been an interesting and exciting merging of surface and well pumps; Dankoff Solar Pumps (surface pumps) was acquired by Solar Power and Pump Company, located in Elk City, OK, in January of 2014. What’s the big deal? Here is what makes this a big deal: these pumps are all repairable. When purchasing one of these pumps, either surface or down-hole, you have the ability to repair them as opposed to the usual “planned obsolescence” or “throw away” premise from some other pump manufacturers. SunRotor pumps have been extremely robust. We have had one call for troubleshooting their units and that problem was resolved within 24 hours. Pretty impressive; we work with a host of pump manufacturers and these pumps have by far the least number of calls from my customers needing some help. A robust pump that is repairable at reasonable cost? We are pleased to be able offer SunRotor and Dankoff Solar Pump products to our customers as a viable solution to remote living, be it livestock watering, irrigation, wildlife management or domestic use. One of the major problems involved with remote livestock watering is long control wiring runs to a storage tank located away from the well head. A lightning strike within 100 yards of the systems has been dangerous and caused consternation on the “why” from our friends. The long wire run can act as a conductor for lightning strikes and fry the controller. Of critical importance is locating a “surge suppressor” into the design of the system. By partnering with our pump suppliers we have come up with a solution that eliminates the long wire runs. Using a manifold with a pressure switch in parallel with the water supply line has proven to be an excellent solution. These pressure switch systems can be yours for around $285 (pricing subject to change). A small price when considering the value of a $2000 pump! By keeping the sensors within a short distance of the well head and controls we can minimize the problem of a lighting strike near the well head. These manifold systems can operate on almost any pump system and from any depth. Typically there will be more than one solution for any given problem. 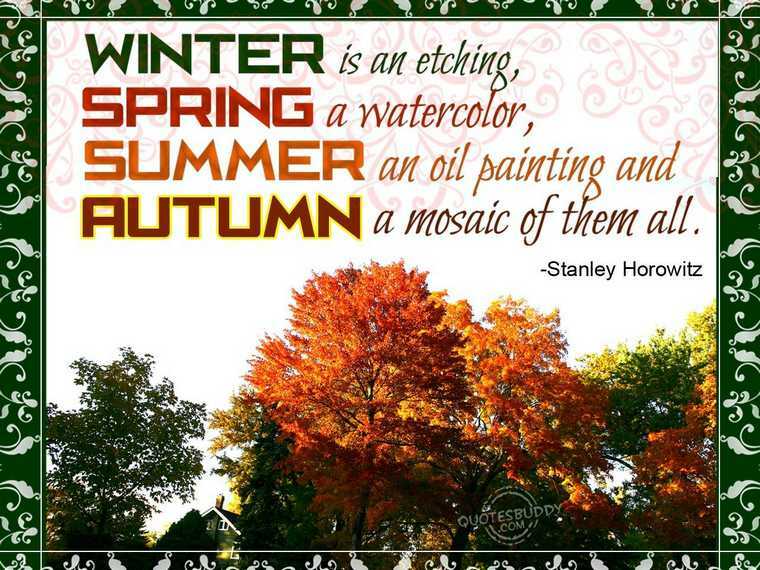 Call your friends at Oasis Montana and let us help you with yours, 406-777-4321. 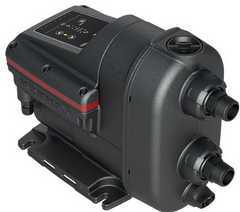 Grundfos has a new pressure boosting pump that provides constant water pressure for your home. The SCALA 2 pressure pump is capable of producing from 22 to 80psi, to 8 taps and up to three floors worth of home -- several people operating taps, sinks or showers are not a problem. This little brute can boost your water pressure, provide “city” water pressure to your cabin while flowing at up to 16gpm. Additionally this pump can draw water from up to 26 ft at sea level while being one of the quietest booster pumps on the market. With a built-in sensor that constantly measures discharge pressure, it stands ready to meet your domestic water needs. For less than $1200 we can bring all the comforts of a home shower to you in your far-flung wilderness retreat, taking some of the rough out of roughing it. People can live without a lot of things, but water's not one of them! Call us for more information, 406-777-4321. 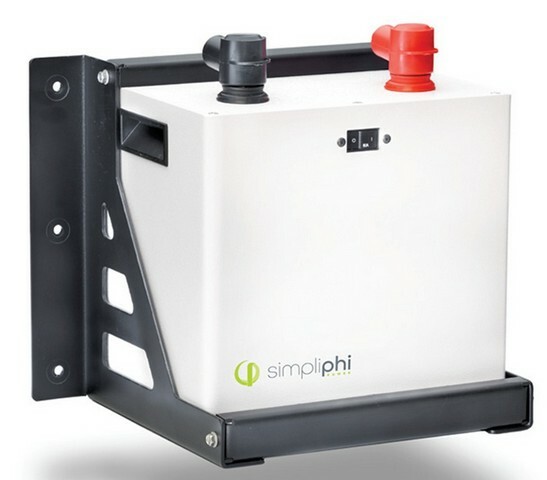 The SimpliPhi Smart-tech Phi 3.4 is a deep-cycle, Lithium Ferro Phosphate (LFP) battery, optomized with proprietary cell architecture. It is modular, lightweight, and can be used for a variety of applications from kWh to mWh, for all a pplications from remote homes, back-up to grid-tie, UPS, mobile and more. With a lifespan of 10,000 cycles to 80% depth of discharge, these just may be the last batteries you purchase! 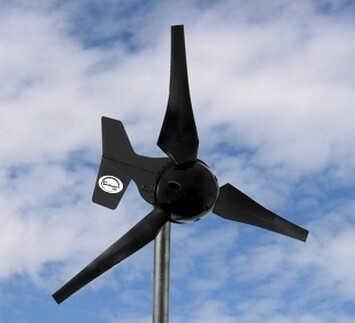 They are maintenance-free, do not suffer thermal runaway like some lithium-ion types, and do not outgas, so they do not require any special ventiltion. Manuals, warranty and specification information -- call or e-mail us for the particulars. Please click here for more information on this exciting battery line. Early on in the pioneer days of solar power, most systems were based on 12V battery charging; the inverters were 12V, and many of the appliances for off-grid homes were specialty 12V appliances. Those first inverters were terribly inefficient, and might lose as much as 50% of its power (or more), converting DC to AC. 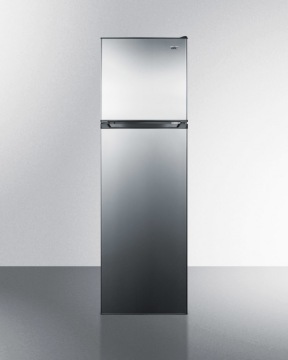 The DC appliances then might include blenders, answering machines, refrigerators/freezers, lighting, fans, vacuum cleaners and water pumps -- and they were pricey. Fast forward to 2016. Now, the inverters for remote homes are usually based on 24V or even 48V, and the inverters themselves are so much more efficient that purchasing expensive DC appliances is no longer the norm or even necessary, as there are many efficient (think Energy Star) appliances available. 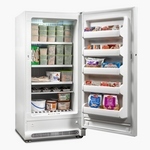 But there are still some loads that lend themselves to greater efficiency when they are DC, namely certain refrigerators, freezers and water pumps. 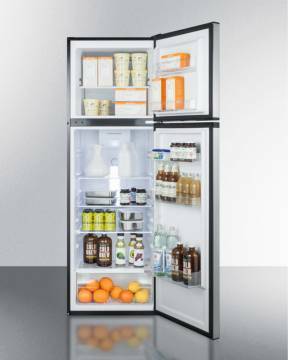 We offer the SunDanzer line of chest models of DC fridges and freezers, and they also offer a small fridge-freezer and larger (390L or 14.7 cu.ft.) freezer. Their units will operate off of a 12V or 24V battery system, and if necessary, can be built at the factory to run off of your 48V battery bank. 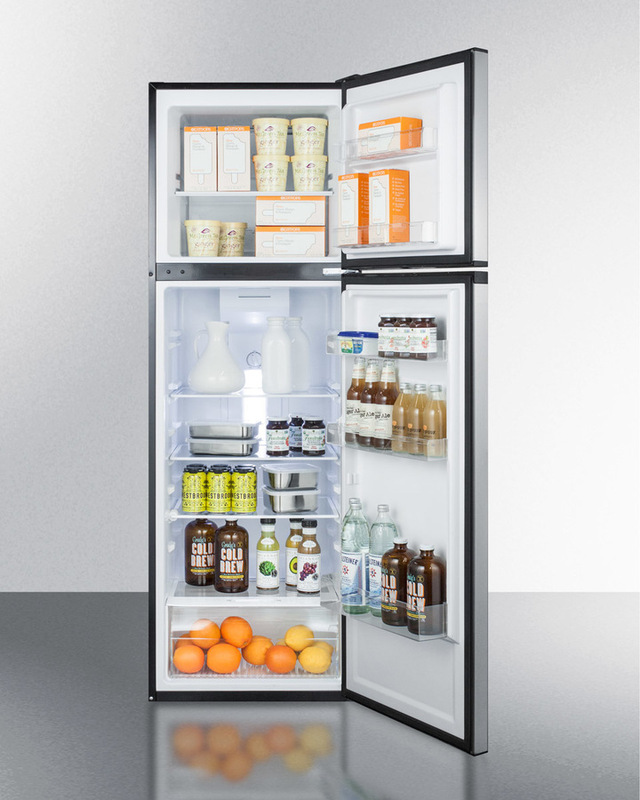 If you look at the numbers on these at http://www.eco-fridge.com/dcfridge.html and http://www.eco-fridge.com/sundanzer390Lchstfrzr.html, these are amazingly efficient. If saving watts for your remote home is essential, check out these DC appliances for the utmost in efficiency and reliability. 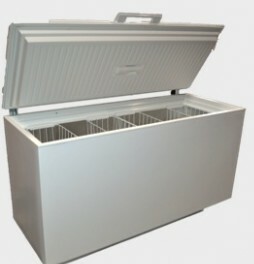 New Non-electric Propane Freezer from Diamond. The Amish folks in Ohio have added another LP appliance to their offerings, a 15 cu.ft. 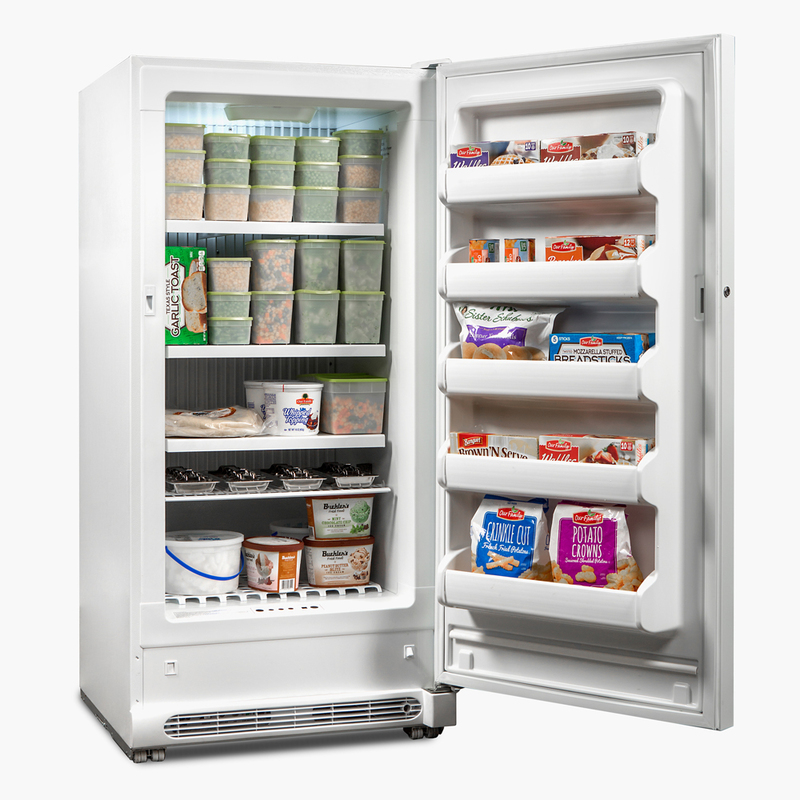 upright gas freezer; $2429 plus shipping, five year manufacturer's warranty. Click here for more information. 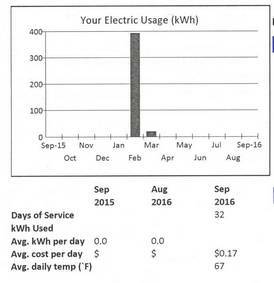 In February we paid for some electricity, the first time in a couple of years. Raising chicks last spring meant we didn't build up so much 'credit' (in terms of kilowatthours accrued) with Northwestern Energy and needed to purchase some electricity from them in late winter to make up the shortfall. We usually just have to pay for the hook-up charge of $5.25 per month. As you can see, it pays to be efficient to keep your bills low! OF INTEREST TO MONTANANS: If you have a renewable power project that you are considering (solar, wind, biomass, hydro, ground source heat pump, etc.) and you are looking for a low-interest loan, visit the DEQ's site at http://deq.mt.gov/Energy/EnergizeMT/renewable/altenergyloan for more information. They are offering loans of up to $40K at a fixed rate of 3.25%; all loans must be paid within 10 years. Combined with the 30% federal tax credit, it certainly makes a renewable project very affordable! There's also a state tax credit of $500 per person (so, $1000 if you are married). If you are outside the state of MT, you can find information on what incentives may be available for your solar project at www.dsireusa.org. Water is the lifeblood of the world. What's YOUR water footprint? "The human failing I would most like to correct is aggression. It may have had survival advantage in caveman days, to get more food, territory or a partner with whom to reproduce, but now it threatens to destroy us all.” -- Stephen Hawking. Please feel free to share this information with others. Knowledge is power!